Writing boards are an indispensable teaching aid in the classroom. We offer boards in a choice of green chalkboard and white marker board, which can double up as a projection screen. Writing boards are available in different sizes and models ranging from a single writing surface, to multiple writing surfaces with folding flaps as well as pylon boards providing vertical movement of a second board. The boards are fitted with a sturdy frame with a tray mounted for the storage of chalk, markers and dusters. The boards are mounted on to the wall with special mounting brackets, and models featuring movement operate on sturdy hardware for ease of operation. This model offers a unique configuration of two writing board surfaces wherein one is stationary, while the other moves vertically up and down on pylons, providing twice the writing area within the same footprint. 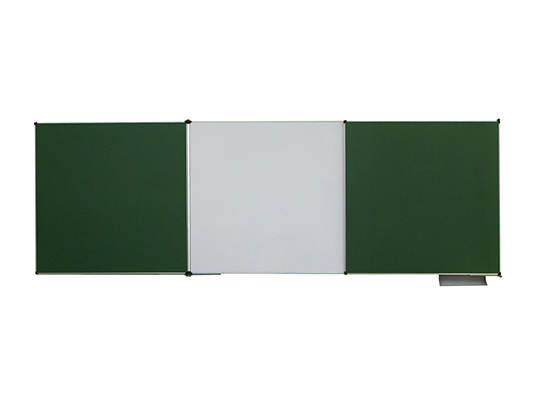 This Nero board has a single writing surface, with an option of either green chalkboard or white marker board enclosed within a sturdy aluminium profiled frame. The Nero 5 surface writing board is provided with two additional folding leaves to give five different writing surfaces, which is useful and space saving for teachers by more than doubling the writing area.